I’ve missed you all so. It’s been two months and six days since I last wrote a post (you may have noticed that I tend to post about once every two months). Guess how old I am? I am 20 years 6 months and 27 days old. So it will be another 5 months and 4 days before I turn 21. I know. Crazy right? I do try to do my best to make the most of my time though. Rather than seeing it as something that I have no control over, I see it as my catalyst to productivity and success. So, a lot has happened since my last post to you all! In my post on April 13, 2014, I revealed my ten 2014 New Year’s Resolutions, joined the Berkeley Film Friends Screenwriting Group towards late February, watched the watched the Oscars, the 86th Academy Awards ceremony, on March 2, 2014, created “Mei Sze Phung’s Plan for the last 2/3 of her year 20 AND beyond for the next few years” document on March 23, 2014, and participated in the Online Hollywood Pitch Festival and was met with support and encouragement. 1. I finished my first year at UCLA as a transfer student. UCLA has brought me great joy and opportunity to grow and mature. It has been a very aesthetic and spiritual experience as well. I loved breathing the cool night air. I loved running with the wind. I loved the independence. I laugh at how I often fell asleep on the couches of my dorm lounge with not a care in the world, but to relax and let the negatives flow out of my body. I loved coming back to the dorms, my home away from home, after class and daily activities because I felt safe and at peace, knowing that I hard a great support system of my RA’s, my roommates, floormates, and all of the Rieber Hall staff, and knowing that for the first time, I could do what I wanted to when I wanted to – I wanted to use this freedom to really focus on my film/dance dream. But not everything was rainbows and unicorns. Since I was on on my own for the first time, I had to learn to embrace solitude and not see it as loneliness, but as a time for reflection, peace, and thinking. The meals were delicious. Being at a big university and living in the dorms is an experience that made me feel spoiled and lucky. Not everyone has the opportunity to get to eat such delicious food from highly-rated dining halls and cafes every day at any time the wanted within the generous dining hours. Not everyone gets a soft, comfortable bed of just the right height and plush (I loved my bed). Not everyone has amazing RA’s, professors, and counselors to guide them throughout their first year at a big college. UCLA has a strong system and structure that really works well because of the effort of everyone combined – there are tons of staff at UCLA and people whose sole purpose at UCLA is to make the student’s experience at UCLA wonderful, valuable, and bearable. It was like heaven compared to community college – like I’d ascended into the skies after enduring the hardships of community college to get to where I wanted to get to, which was UCLA. Yes, community college was a massively difficult battle that trained me to become a hard-core enough warrior for a top university like UCLA. Because at UCLA, I was shooting rainbows and unicorns, acing everything! Just kidding, but I was doing fairly well because of the tough training I got from community college, so I highly recommend transferring to UCLA from a community college – it is a rewarding path. But just because I am at UCLA doesn’t mean I’m everything. It doesn’t mean that I’ve achieved everything that I ever wanted to. It means that I’ve laid down my foundation and blueprint, and now I have mountains to climb, and there’s no other place that I would want to climb these mountains than at UCLA. And lucky for me, I love these mountains, because they are the film, dance, and hunger activism mountains, everything that I am passionate about. Thus, I know it will be an enjoyable climb and journey. 2. I wrote my 115-page script entitled “A Dance to World Peace” in about 9 days, starting from May 19 to May 27, 2014. 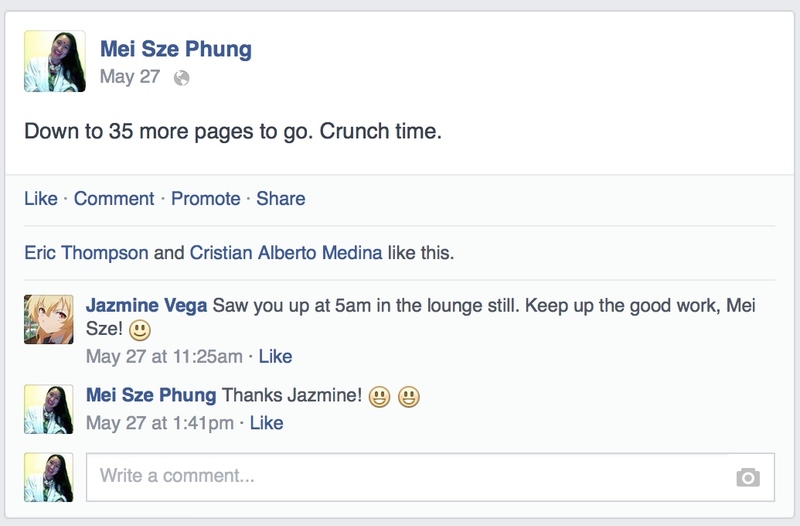 As you can see, I was very public about it on Facebook, as I wanted to hold myself accountable. I submitted my script to the contests that I said I was going to submit to. The next step is to continue to edit it and polish it so that it is the sharpest it can be. I also submitted my idea to the Script Pipeline Great Movie Idea Contest. Fingers crossed! 3. I planned my multi-video dance based intervention (a community based arts project). The plan was submitted to my WL ARTS 103 Arts in Communities course instructor as my final project, so now I am just waiting for her feedback so that I can put the plan into action! She is an amazing professor! 4. I got the pink-red iPhone 5c. Yes, this is random! I feel really tech-savvy. It’s a little distracting at times, but I’m amazed at what technology these days can do. We’ve come a long way as an advanced society. Also, do you want to know why I chose pink-red? Originally, I wanted red, as it is my favorite color. But since there was no red iPhone 5c, I chose the next closest color that would complement red – pink red. Pink red is symbolic for “outrageous, imaginative, innovative” as well as “unconditional love and nurturing”. 1. On April 11, 2014, I watched “Tangled”(2010). 2. On April 14, 2014, I watched “Hercules”(1997). Disney movies have a common element: They make me feel good and happy and they’re addicting. 3. On April 15, I watched the film “Gandhi” (1982). It was quite inspirational, yet realistic. I aspire to have the courage like people like Gandhi. 5. On April 17, 2014, it was confirmed that I would be living at the Visual and Performing Arts themed floor (UCLA’s newest themed floor) of UCLA’s dorm for the 2014-15 school year. I was ecstatic! 6. On April 19, 2014, I attended a teleconference class entitled “How to Get an Agent”. SO USEFUL!!!! 7. On April 22, 2014, I met with Dan Froot, a staff in the World Arts and Cultures Department at UCLA, who introduced me to Hunger Action Los Angeles, the grassroots organization I would be researching for my WL ARTS 124 Introduction to Field-Based Research Methods class. 8. On April 24, 2014, I attended the Berkeley Film Friend’s Writing Group, where I got to share my “A Dance to World Peace” treatment draft #3 and receive constructive feedback. 1. On May 2, 2014, I visited Hunger Action Los Angeles for the first time. It was a great and useful learning experience. 2. 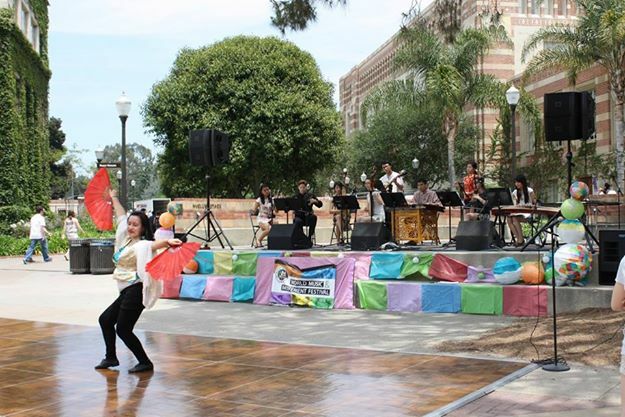 On Saturday, May 3, 2014, I performed for the Spring 2014 World Music and Movement Festival at UCLA! 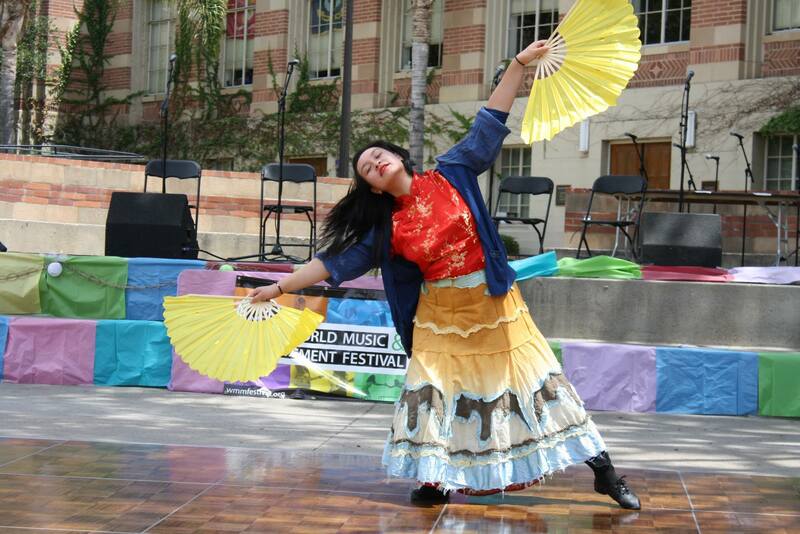 Basically, I represented China through performing traditional and contemporary Chinese dance. For my first act, I had about a ten minute solo dance (three parts: 1) About a three minute Chinese fusion dance consisting of three parts a) Umbrella dance b) Cheerful Chinese ocean blue fan dance c) contemporary motivational hip-hop dance with red and gold ribbons 2) Enlightenment dance with yellow fans 3) Hong Kong Oriental Hip Hip dance with smaller size sparkly dark blue fans.) For my second act, I collaborated with the Music of China Ensemble and danced while they played the song “Return to Dreams”. For this act, I used the flowy red Chinese dance fans and transitioned into using long white Chinese sleeves. 3. On May 17, 2014, I rewatched “Mulan”(1998). Staying true to my culture no? Mulan is a brave soul. 4. On May 18, 2014, I watched “Pocahontas”(1995) and “Pocahontas II: Journey to a New World”(1998). I watched the first. It and me hooked. So I watched the sequel! 5. 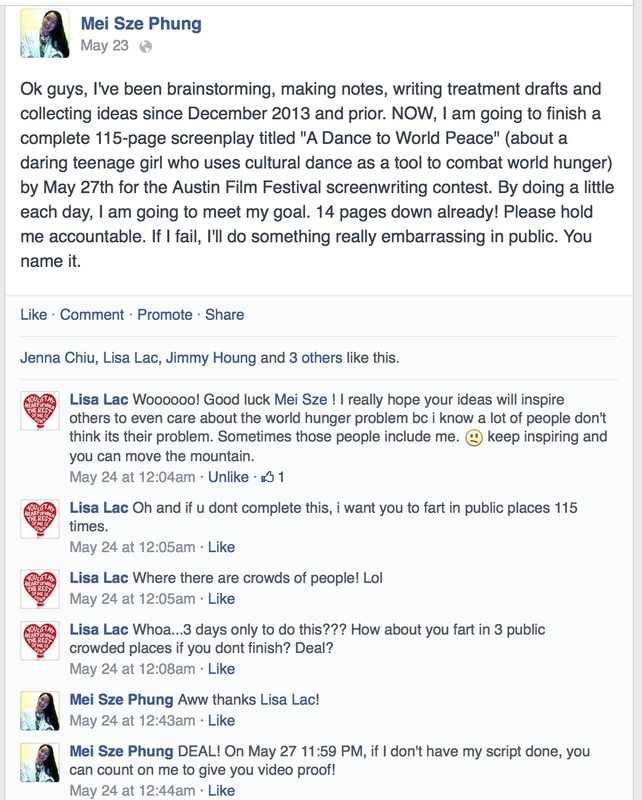 Monday, May 19, 2014, was the day I proposed to embark on what seemed like a crazy impossible feat – to write 115 pages for my screenplay “A Dance to World Peace”. I stayed up all night and into the next morning and got pretty much my first 10 pages done (basically the part about where we meet the film’s hero and the world that she lives in). Logline for your reference again: “A Dance to World Peace” is a drama film about a daring teenage girl who attempts to use dance from around the world as a tool to alleviate global hunger, but causes a turmoil that she must fix herself in order to bring world peace. 6. On May 20-21, 2014, I participated in Hunger Action Day in Sacramento, where I lobbied for anti-hunger legislation with hundreds of people at the California State Capitol in Sacramento. It is an experience that I have no regrets going taking part in, as it really opened my eyes to let me see that the real world is harsh, as is trying to accomplish anything through politics because things can get complicated. 7. On May 27, 2014, I finished writing 115 pages for “A Dance to World Peace”, in time to submit it to the screenwriting competitions that I had planned to submit to. I was able to accomplish this by publicly telling my friends on Facebook that I would do it and having them hold me accountable. If you look at my pictures above, you will see that I promised that I would do something embarrassing in public if I failed to achieve this goal – (see picture for what I would have had to do had I not accomplished my goal (there’s one of them); the second one was that my sister, Linh, told me that I could not talk for a week if I failed) – of course I had to reach my goal! 1. On June 6, 2014, I watched “Rebel Without a Cause”(1955), a film where an actor, James Dean, spoke for an entire generation, bringing “his explosive presence to the screen in Nicholas Ray’s ‘tense, exciting melodrama'”. Here’s more info: The landmark teen film that solidified Dean’s image with the public follows the story of rebellious middle-class teens, disenfranchised with their parents, and given to a life of thuggery and deadly dangerous drag racing to win over women. (I googled all of this) I also think it’s a powerful coming-of-age story. 2. One June 7, 2014, I finally got to watch “Frozen”(2013), a film that a few people have told me was really good. I found the songs to be quite catchy and the theme of female leads seizing the day to be very motivational. 3. 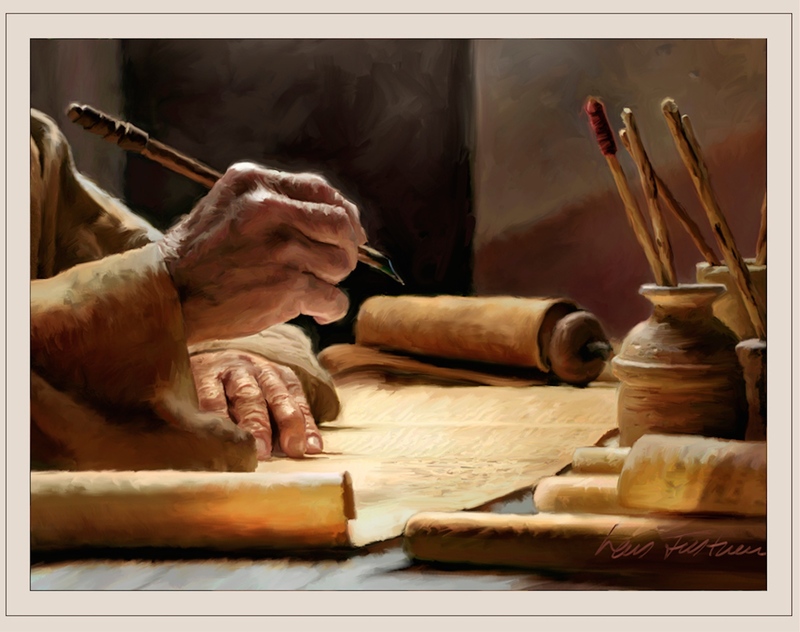 On Sunday June 8, 2014, I attended the teleconference class “21 Powerful Rewrite Strategies”. It was incredibly useful. Unfortunately, since I woke up late, I missed a portion of the class. Thus, I will be asking around to see if anyone has notes that they can let me borrow to catch up on what I missed! 4. On Friday, June 13, 2014, I finished planning my multi-video dance based intervention (a community based arts project). As stated earlier, the plan was submitted to my WL ARTS 103 Arts in Communities course instructor as my final project, so now I am just waiting for her feedback so that I can put the plan into action! She is an amazing professor! That’s all the updates I have so far! 1. Research more on issues of hunger, both through scholarly sources and through interviewing victims. 2. Refine and sharpen “A Dance to World Peace” script. 3. Put multi-video dance based intervention into action. 1. Polishing my “A Dance to World Peace” script until it is at a level where it can be sold to a major film studio. 2. Executing the multi-video dance based intervention to gather support and a following as the film becomes produced. Hopefully, pre-production, production, post-production, and marketing of “A Dance to World Peace ”!